The war with Britain was over, for now, and it was time for the United States to build its insitutions, of democracy, of the frontier, of its military. And it was time to prove to the world that this form of government could succeed, and prove its line of succession was possible. When Washington gave way to Adams in 1797, that act secured first proof that its concept had merit, and the world was watching. After your visit to a historic location you love, consider a contribution to the local of national historic preservation society. Each year, thousands of acres of our historic past are under the threat of extinction. A few dollars now could preserve it forever. Image above: America builds its Navy. Image right: Independence Hall, Philadelphia. Engravings courtesy National Archives. January 8, 1790 - The first State of the Union address is given by first president George Washington. February 1, 1790 - The Supreme Court of the United States convenes for the initial session. March 1, 1790 - Congress commissions the first U.S. census. When completed, it shows that 3,929,214 lived in the nascent democracy in 1790. The most populated state, Virginia, has 691,737. The center of population was 23 miles west of Baltimore, Maryland. July 16, 1790 - George Washington, as President, approves the Residence Bill, legislation that authorizes the buying of land along the Potomac River for federal buildings and parks, creating the District of Columbia. July 31, 1790 - The first patent in the United States is issued to inventor Samuel Hopkins for improved method of making potash. 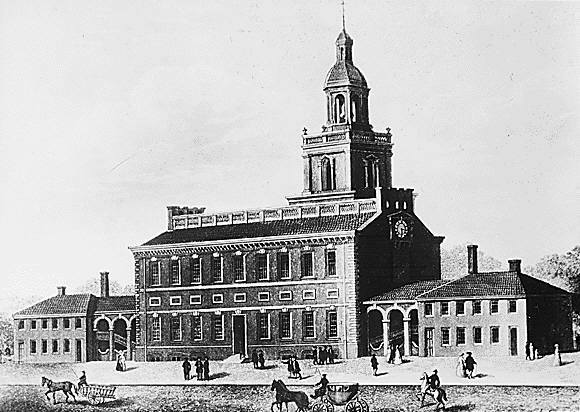 February 25, 1791 - The First Bank of the United States chartered in Philadelphia for twenty years by the United States Congress, part of the three part expansion of federal fiscal policy, including a federal mint and excise taxes. March 4, 1791 - Vermont is added as the 14th State. Carved from portions of New York and New Hampshire, and first known as New Connecticut, Vermont spent fourteen years as an independent republic before joining the Union. April 27, 1791 - Samuel Morse, United State inventor, is born. He would later develop the Morse code for use in the first electric telegraph in the United States. August 26, 1791 - The steamboat is patented in the United States by John Fitch. First launched on the Delaware River in 1787, and operated passenger service from Philadelphia to Burlington, New Jersey, which proved unprofitable. December 15, 1791 - In Philadelphia's Congress Hall, the Bill of Rights, which constitutes the first ten amendments to the Constitution, takes effect. Two of the original twelve amendments do not pass. February 20, 1792 - The United States Post Office Department is established, signed into law by President George Washington. April 5, 1792 - The presidential veto is used for the first time when President Washington turns down a bill to apportion representation amongst the states. May 17, 1792 - The beginnings of the New York Stock Exchange is established with the signing of the Buttonwood agreement. October 13, 1792 - The cornerstone for the U.S. Executive Mansion (called the White House since 1818) in the new District of Columbia is laid by freemasons and the commissioners of the district during the construction of the home of the president. It would take eight more years before President John Adams would move into the home. December 3, 1792 - George Washington, a Federalist, is reelected president of the United States with no opposition, with John Adams elected Vice President. The Federalists, who believed in a strong central government, outnumbered the other political party at the time, the Democrat-Republicans, who decided against a political fight due to Washington's popularity. 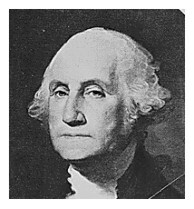 Washington had considered not seeking a second term, but decided to serve again, in some part due to trying to stem the tide of political parties. February 12, 1793 - The United States Congress passes a federal law requiring the return of slaves that escaped from slave states into free territory or states. April 22, 1793 - George Washington signs the Proclamation of Neutrality in the French Revolutionary Wars, where France has already declared war on England, the Netherlands, Austria, Prussia, and Sardinia. August 17, 1793 - Dr. Benjamin Rush confers with two Philadelphia doctors about an epidemic of disease along the docks of Philadelphia over the preceding two weeks. By November, over 10% of the population of the city had succumbed, nearly 5,000 people. The disease had been brought to the city by refugees from Haiti, then coupled with a wet spring and swamps that became an incubator for mosquitos. September 18, 1793 - George Washington lays the cornerstone in the Capitol building, beginning the construction on the design by Dr. William Thornton. December 9, 1793 - The American Minerva, established by Noah Webster, becomes New York City's first daily newspaper. March 14, 1794 - Eli Whitney patents the cotton gin, which could do the work of fifty men when cleaning cotton by hand. March 27, 1794 - The U.S. Government establishes a permanent navy and commissions six vessels to be built. They would be put into service three years later. August 20, 1794 - General Anthony Wayne, commander of the Ohio-Indiana area, routs a confederacy of Indian tribes, including Shawnee, Mingo, Delaware, Wyandot, Miami, Ottawa, Chippewa, and Potawatomi, at Fallen Timbers on the Maumee River, causing a retreat in disarray. September 1, 1794 - The Whiskey Rebellion occurs when western Pennsylvania farmers in the Monongahela Valley, upset over the liquor tax passed in 1791, are suppressed by 15,000 militia sent by Alexander Hamilton to establish the authority of the federal government to uphold its laws. November 19, 1794 - Jay's Treaty is signed between the United States of America and the Kingdom of Great Britain. This treaty tried to settle some of the lingering troubles stemming from the American Revolution. January 14, 1795 - The University of North Carolina, at Chapel Hill, becomes the first operating state university in the United States, and the only public university to graduate students in the 18th century. February 7, 1795 - The United States passes the 11th amendment to the U.S. Constitution on the subject of each state's sovereign immunity. 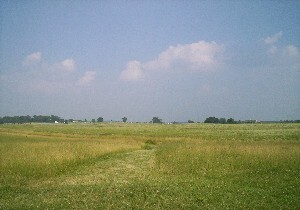 August 3, 1795 - General Wayne signs a peace treaty with the Indians at Fort Greenville, Ohio, ending the hostilities in what was then known as the Northwest Territories after the Indian confederation's defeat (the treaty included the above mentioned tribes, as well as the Eel Rivers, Weas, Kickapoos, Piankeshaws, and Kaskaskias) at Fallen Timbers the year before. October 27, 1795 - The Treaty of Madrid is signed, establishing the boundaries between the Spanish Colonies and the United States. November 28, 1795 - The United States purchases peace with Tunis and Algiers by supplying a frigate and over $800,000. June 1, 1796- Tennessee is admitted into the Union as the 16th state. July 8, 1796 - The United States State Department issues the first passport. July 11, 1796 - Possession of the city of Detroit by the United States is taken by terms of the Jay Treaty with Great Britain. September 19, 1796 - President George Washington gives his final address as president, published in the American Daily Advertiser, urging strong warnings against permanent foreign alliances, large public debt, and a large military establishment. November 4 to December 7, 1796 - The U.S. Electoral College meets to elect Federalist John Adams as president. John Adams defeated Thomas Jefferson, of the Democrat Republican party, whose platform included the notion of a weak central government, in the U.S. presidential election. Political parties came into prominence with this election after the retirement of George Washington. Electors who chose the president were chosen by the states, using various methods, including the popular vote or by state legislators. Adams received 71 electoral votes to Jefferson's 68. January 3, 1797 - The Treaty of Tripoli, signifying peace between the United States and Tripoli, is signed at Algiers. March 4, 1797 - John Adams succeeds George Washington as president of the United States. July 10, 1797 - The first of three ships, the U.S. frigate United States, is launched by the United States on this day as it begins to build up its navy. Later in 1797, the other two ships would be launched; the Constellation in Baltimore on September 7; and the Constitution (old Ironsides) in Boston, September 20. October 21, 1797 - The Constitution, a 44 gun frigate, is sent into service from Boston Harbor against Barbary pirates off the coast of Tripoli. December 17, 1797 - Joseph Henry, an American scientist is born. He would serve as the first president of the Smithsonian Institution and is credited with discoveries in the field of electro magnets. May 4, 1798 - Thomas Jefferson, then Vice President of the United States, informs the American Philosophical Society of his invention of a new mould board for a plow. April 7, 1798 - The Territory of Mississippi is established from parts of Georgia and South Carolina, and later expanded to include disputed territory of the United States and Spain. German-American Gottlieb Graupner settles in Boston and becomes the father of orchestral music in the United States. He would later organize the Philharmonic Society. July 7, 1798 - Congress voids all treaties with France due to French raids on U.S. ships and a rejection of its diplomats, and orders the Navy to capture French armed ships. Eighty-four French ships are captured by the U.S. Navy (with 45 ships) and private ships (365). July 14, 1798 - The Alien and Sedition Acts, four bills that included making it a federal crime to publish malicious statements about the United States Government, plus powers of the President to control immigration and imprison and deport aliens who opposed the government, go into law. November 16, 1798 - The Kentucky Resolve, opposing the expansion of government power in the Alien and Sedition Act and deeming them unconstitutional passes. On December 24, 1798 the Virginia legisulature passed a similar Resolve. Three of the bills were eventually repealed, with the fourth, the Alien Enemies Act, with revisions, is still in effect. 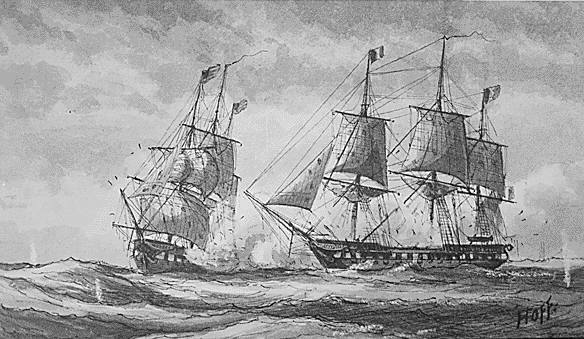 February 9, 1799 - The French warship L'Insurgente is captured by the U.S.S. Constellation. Napoleon stops the French raids after becoming First Consul. February 15, 1799 - The first printed ballots in the United States are printed in Pennsylvania. March 29, 1799 - A law is passed to abolish slavery in the state of New York, effective twenty-eight years later, in 1827. The American System of Manufacturing is invented by Eli Whitney, who uses semi-skilled labor, machine tools, and jigs to make standardized, interchangeable parts, then an assembly line of labor. Whitney first used the system to manufacture 10,000 muskets for the U.S. Government in a two year contract let in 1798, but took eight years to fulfill. Some contend that Whitney did not invent this method, but just promoted it. December 14, 1799 - George Washington, the 1st commander of the Revolution and President of the United States, passes at his estate in Virginia. 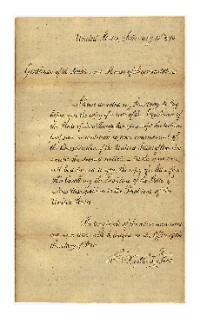 Message from George Washington sending vote of New Hampshire on the Bill of Rights. Photo courtesy National Archives. General Anthony Wayne. Image courtesy National Archives. 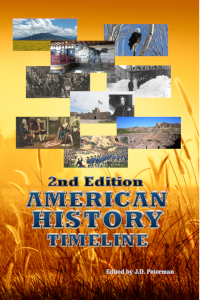 When George Washington gave up the presidency after his second term in 1797, it may have been the most remarkable event in U.S. history. It was the first time a leader gave up power willingly in a democratic shift to another man. Image courtesy National Archives.